The following is based on connection calls for coaching services and you’ll see common threads throughout that you can relate to your own service & even some product based businesses. It’s all about helping your client get clear on what they want and being honest and open about who you can help them with that. PS. Being honest means if you don’t genuinely feel you can give them what they need, tell them. There’s more at stake than a quick sale, your reputation precedes you! 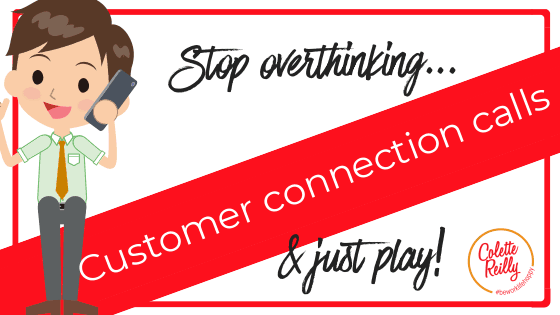 Ready to stop overthinking & start playing? Spend a few moments getting into a really positive and effective state of mind and body. Connect with the impact you make through working with your clients. Set the intention for this call to be REALLY blooming good fun and useful for both of you. Visualise your client leaving this call feeling exactly how you want them to (perhaps empowered, inspired) and, importantly, crystal clear as to what they want to do next. Let go of any attachment to the outcome of this call. Let go of any need to people please…you’re here to support another human get clear on what they want & need. If you have filtered effectively, the people who you’re investing your time in speaking with will be close to your ideal customers so your focus is simply on being there for them now. Yes it would be lovely to make a sale but for now that’s not your focus. Money is simply one of many ways to exchange energy and similar energies are attracted to each other. Get & stay in the energy you want your client to be in, and the rest will flow from here. Imagine yourself being of highest service to your client and that whatever happens will be for the greater good of both of you. Take a minute or so to explain to your client what will happen in your time together on the call. This helps the person in front of you feel safe and as such open up to you. How long the call will be. We’ll get clear on what you would love to achieve. We’ll design a brief plan that will help you achieve what you want. We’ll uncover any challenges and hiccups areas that may be slowing you down or sabotaging you. If it feels like we’re a good fit then I’ll share how we could potentially work together to help you get the results you want. You’ll leave with more energy, motivation and clarity to really make good things happen. >> Tell me a bit about what you currently do and what you would LOVE to have happen in your life and work. >> What would be the BEST part about that? it’s important to establish what is driving the person in front of you because THIS is what will help you see how you can et serve them, and them decide if you are the best fit for them. >> If you could break this big wish into say 3 main parts or stages what would these be? Help your client get REALLY clear on what they want so you both have a measure of success. >> What impact are these issues having on your (area of focus)? >> How long have you had these challenges? >> What have you done about them up until now? >> How has having these challenges impacted on you? >> What’s the WORST part about these challenges? This bit is giving them the experience of working with you AND helping them further unpick and clarify what they want and need. >> If you don’t do something about these issues, what do you think will happen? >> How soon do you want to turn things around and start experiencing the results you REALLY want? >> Why do you feel like now is a good time to do take action? >> Do you feel a sense of urgency to deal with/overcome ______ or is it something that if nothing’s changed in 6 months that’s ok? >> Is having __________non negotiable for you? >> Imagine for a moment you’ve overcome all these challenges and created ________ What’s that worth to you? Is now really a good time for them? If it is great! And if it’s not, that’s ok too..now you both know and can take things from here. What are the competing priorities for them? Help them get clear on what there top priorities are. Why you? Inspire them to see the benefit you bring! > If you could release all of your challenges and start rocking your life and work, what would that do for you? > What would be the BEST part of that? >> We’re nearly finished here and I want to make sure you’ve got everything from our time together you expected. >> Looping back to the beginning of our time together, do you feel clearer about what you would love to achieve in your (focus area)? >> We created a plan to help you get a better sense of how you can tangibly make things happen. We did this quickly so it probably needs a bit of fleshing out but are you clearer on what you need to work on to get the results you want? > I also wanted you to feel energised, inspired and motivated that you can REALLY make what you want happen. Do you feel more motivated to take action and make good things happen now? > We also uncovered some of your hiccup areas and challenges that could be slowing you down or stopping you. These are super common…. >> I have a program specifically for people in your situation, would you like to find out more about it? This is about establishing the value of your coaching. Relate everything in this section to your clients personal aspirations, values and the challenges they raised. How do you support your clients? Explain this to them. I have 5 principles I support all my clients through. I’ll help you appreciate yourself and the amazing potential that is in you right now to create whatever the heck you want to. I’ll make sure you believe in yourself and the possibilities open to you. You’ll get super clear on what you REALLY want and create a plan as to how you can make that happen. Depending on how you choose to work with me, I’ll be with you as your supportive partner as you DO the work and take the actions you want & need to create the results you want, and be in the wings to help keep you on track. And all throughout this I’ll be helping you develop your emotional intelligence and target your energy so you learn how to tap into inner resourcefulness…and discover your invincibility factor! Describe how you work with your clients. If you prefer to offer bespoke proposals then say this now and suggest some possibilities to gauge you’re on the right track. > Does that sound valuable/ useful so far? What do you see as the benefit of us working together? > How would your (area of focus) be different as a result of our time together? Most people get icky when it comes to the ‘money chat’…stop it! It’s simply a conversation that includes numbers. Consider you’re talking about something that isn’t your own service so it’s purely factual. Be clear in advance of your boundaries and what, if any, willingness or ability to wiggle you have. > This program/service is £____ for which includes…. > Take as long as you want to mull that over. You may want to offer special ‘fast acting’ bonuses for making a decision to commit within a certain timeframe. And you may want to offer a payment plan but remember if you are in the UK if you choose to offer a payment plan that is more expensive than the full price this is seen as the equivalent of an interest rate for which your business needs a credit licence. Please ask for legal advice specific to your business requirements to ensure your business stays compliant, I am not a legal expert. I invite you to get clear on what your ideal situation is and how you can encourage your customer to behave in the way that serves your outcome. Give space for them to reflect and think. Be curious about these and coach them through them. Often objections are polite distractions from belief in YOU or belief in THEMSELVES. Stay focused on serving the best interests of the person in front of you. How confident are you that your service is the best solution for that person? How confident are you that now is the best time for them to optimise the value they’ll get from working with you? What do they need to make a decision that works for them? >> Brilliant! So you’d like to go with ‘x service’, when would you like to start? Trust yourself and how YOU want to do business. You may want to have a sales focused conversation in a separate call organised shortly after your discovery session. It’s your business and your rules, play with options and notice your energy and the results you get with each. It may be person specific or you may prefer to have a set process. Do what works. Support your potential client stay in that state of possibility and motivation until they can make a decision that’s right for them. Focus on helping your client to make the best decision for them and you’ll both reap rewards. LET GO OF ANY ATTACHMENT YOU MAY HAVE TO THE OUTCOME, if you want happy clients you need to focus on THEIR wants and needs, not yours. Even if they decide not to work with you right now, keep in touch and nurture the relationship. They may turn into a yes or refer other people to you…customer service is queen.